Now Lebanese Army officials are warning of a plot to drag their country into neighboring Syria’s present conflict, with Lebanon’s northern city of Tripoli being the likely initial flash point for such a conflagration. Within Lebanon, Future parliamentary bloc leader MP Fouad Siniora has called for Hezbollah to withdraw its fighters from Syria, calling their aid to Syria’s Assad government as “shameful”, and with calls to exclude Hezbollah from any future government. On the other side, Lebanese Foreign Minister Adnan Mansour has appeared to side with Hezbollah. Lebanese President Michel Sleiman is being pressured behind the scenes by U.S. President Barack Obama who has condemned the Shi’ite organisation’s “active and growing role in Syria” in a telephone call this week to Sleiman. “The two leaders agreed that all parties should respect Lebanon’s policy of disassociation from the conflict in Syria and avoid actions that will involve the Lebanese people in the conflict,” a White House statement said. This latest multi-pronged political from abroad and within move against Hezbollah within Lebanon has materialised in the the last few weeks, which strongly hints at some major confrontation being engineered behind the scenes. Judging by the economic and political struggle facing the Lebanese government, it’s an ideal situation for both incentives – and threats, to be dangled by the world powers and Israel in front of political factions in order to secure the favoured outcome of the west in Syria and beyond. Are the Lebanese leaders strong enough to withstand such pressure? Time will tell. If there is a geopolitical game going on behind UN and western government doors, it is being focused around the political and military isolation of Lebanon’s Hezbollah organisation. Last month saw its fighters engaging the foreign Islamist opposition insurgents in Syria, arguing that their interests are in protecting the Shi’ite community in Syria from attacks by takfiri factions backed by Israel, Great Britain, France, Turkey and the United States. This point has been mostly ignored by the global powers, their media, as well as pro-western political rivals within Lebanon, indicating that the game being played here extends far beyond the borders of Syria and Lebanon. The Lebanese Army warned Friday of a plot to drag Lebanon into the 2-year-old war in Syria as clashes between rival gunmen renewed, shattering a lull of several hours despite a heavy military deployment in the northern city. The afternoon fighting, which pitted gunmen from the Hezbollah-backed Sunni Nashar family against gunmen supported by Salafist groups, wounded a man and a woman from the Nashar family, security sources said. The two sides exchanged machine-gun fire and rocket-propelled grenades in Tripoli’s Old Souk before the Army intervened to halt the fighting by trying to silence the sources of fire. 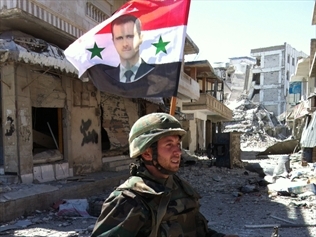 The scene of the fighting is about 2 kilometers from the traditional frontline between the Jabal Mohsen neighborhood, whose residents support President Bashar Assad, and the rival Bab al-Tabbaneh district, whose residents back the uprising in Syria. Since the latest round of heavy fighting erupted between the two rival districts last month, 33 people, including three soldiers and a policeman, have been killed and more than 200 wounded. The fighting in the northern city has been linked to the conflict in Syria. The security situation in Tripoli was generally calm Friday, except for sporadic sniper fire between Jabal Mohsen and Bab al-Tabbaneh. Armed with political cover from the caretaker government and Tripoli’s politicians, the Army boosted its deployment with armored vehicles, manning patrols, setting up checkpoints and chasing gunmen. “The Lebanese Army, as firm as its security measures will be, urges citizens to be wary of the plots aimed at taking Lebanon backward and dragging it into a futile war,” it said in a statement. “Do not be dragged behind groups that want to use violence as a means to achieve their objectives,” it added. “But in recent days, some groups have seemed determined to create tensions among the [Lebanese] against the backdrop of the political divisions in Lebanon over the military developments in Syria,” it added. 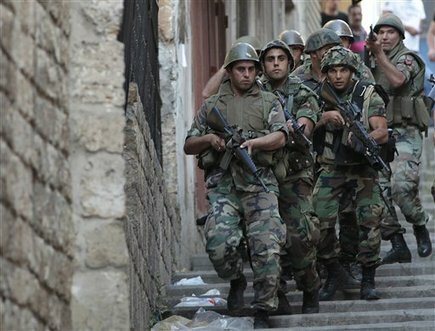 The statement said the Army had been carrying out a series of firm security measures in Tripoli, Sidon, Beirut, the Bekaa Valley and Mount Lebanon. “The Army’s operations will be deterrent and stringent. The Army is determined to implement its security plan in Tripoli no matter what the cost,” the statement said. President Michel Sleiman expressed satisfaction with the Army’s deployment plan in Tripoli and surrounding areas. While appreciating the Army’s sacrifices and national role in preserving civil peace, he stressed the need for leaders and citizens to cooperate with the military’s measures to maintain the area’s security and safety of its residents, said a statement from Baabda Palace. Caretaker Prime Minister Najib Mikati chaired a series of meetings at his residence in Tripoli to follow up the Army’s security measures in the city. “The Lebanese Army is determined to carry out its security plan to restore calm and stability to the city in implementation of decisions taken previously by the Cabinet and the Higher Defense Council,” Mikati said. The Army set up checkpoints at the entrances to Tripoli and on the city’s main roads following heavy clashes in the past few days. Over a dozen people have been wounded since late Thursday, security sources said. Six people have been killed since violence erupted last week. Security sources said five people were hurt overnight when a rocket-propelled grenade fell on Syria Street that separates the warring neighborhoods of Bab al-Tabbaneh and Jabal Mohsen. An Army officer and a soldier were among the three wounded from the fighting in Jabal Mohsen, according to the sources. They were identified as Lt. George Hajj and Private Ahmad Ismail. The military said Thursday that it had seized two arms depots, one in Tripoli’s Souk al-Qameh and the other in Jabal Mohsen.